This miniature painting is one of a group of 17th-century unfinished miniatures on tablets of vellum originally interleaved into the blank pages of a leather-bound book traditionally called ‘Samuel Cooper's Pocket Book’. This book was acquired by the V&A in 1892, when all the works were believed to be by Samuel Cooper. It is now agreed that four are by Cooper and the other ten, except one, are by Susannah Penelope Rosse. It is possible that this ‘Pocket Book’ actually belonged to Susannah Rosse and her husband, Michael Rosse, a wealthy jeweller. Susannah was the daughter of Cooper's fellow miniaturist, Richard Gibson. She grew up in London only a few streets from Cooper and, as a married woman, lived in Cooper's former house on Henrietta Street, Covent Garden. She was a great admirer of Cooper. 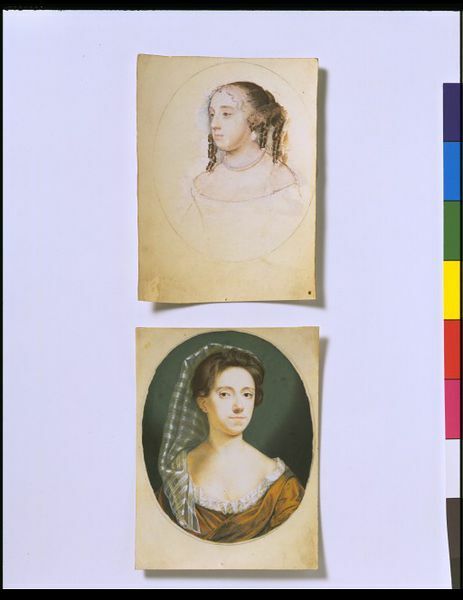 The sale of Michael Rosse's collection of art in 1723, over 20 years after Susannah Rosse 's death, included original works by Cooper and also acknowledged copies of Cooper by Mrs Rosse. 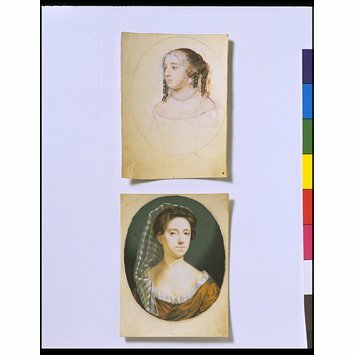 Examples of Cooper's unfinished works would have allowed Susannah Rosse to study closely Cooper's technique. This portrait is inscribed on the back ‘Mrs Rosse’ and is almost certainly a self-portrait. The other works by her in the group are a remarkably intimate record of relations and also of neighbours on Henrietta Street. Portrait of a woman, to front, head turned slightly to right, wearing an orange-brown dress with white frill edging and a long stripped veil over right shoulder; oval on a rectangular sheet. Features very delicately hatched and blended in pale browns and sanguine, with touches of black and white in the eyes, on a pale but rich carnation ground; hair in brown wash, lined with dark brown/black and with touches of grey and some ochre highlights; head-dress in transparent pale brown wash, with touches of white and ochre, and red-brown; dress in brown wash modelled in black and grey; background an opaque green wash, hatched in black to the left and right above shoulders; on vellum put down on a leaf from a table-book. Provenance: Presumably acquired from Cooper's estate by the Rosses, or perhaps by Priestman (see Rosse, Cat. No. 143) and perhaps in the Michael Rosse sale, 2 April 1723; eventually purchased by Edwin [Durning] Lawrence before 1862, and sold by him to the Museum for £525 in 1892. 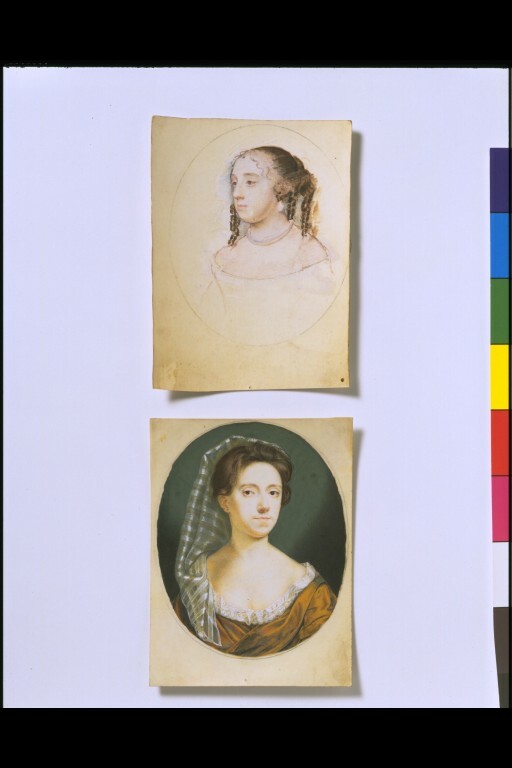 Portrait miniature of a woman, presumed to be a self-portrait of Susannah-Penelope Rosse, watercolour on vellum, 1685-1690. Murdoch, John. Seventeenth-century English Miniatures in the Collection of the Victoria & Albert Museum, London: The Stationery Office in association with the Victoria & Albert Museum, 1997.